How exciting. I love this kind of thing and the opportunity it presents for self-reflecting. (Yes, I’m a dork in this way. “You sure do like to check in with yourself, don’t you?” someone observed not too long ago. Darn tootin’. I like to know what’s up with me and how it measures up against how things were with me before. It might be a little obsessive, but at this point I figure it’s better than ignoring my innermost feelings). Prior to my geoYoga experience, I had done some yoga classes through the local adult education program. These were at a gym, an hour each. The teacher was pleasant, led us through some postures and included Savasana (challenging, due to the Eagles music inevitably blasting through the walls from the weight room outside). I thought it was all pretty fantastic, until another student said to me, “I’ve been going to this guy’s classes at the Civic Center, you should check it out. He’ll tell you if you’re doing the postures right. And he lights candles! The class is 75 minutes long.” Wow, 75 minutes, I thought. “That’s a LONG TIME,” I said, not realizing that she was intending this to be a selling point. Oh, how things change. It had been really, really hard for me to get up the nerve to sign up for that first yoga class. I felt like such an idiot walking into the gym, as though I were wearing a sign that said “I AM A CLUELESS SHMUCK. YOU SHOULD LAUGH AT ME.” Making the transition to the second yoga venue… well, that required even more courage on my part. I had to find the location (I drove by a few times to be sure I had it right). I also included some Internet research, which helped me to feel more anxiety about whether or not I needed a special towel to cover my mat. I called and asked how much and when it was (I dreaded showing up at the wrong time, with the wrong sort of money- how people would look at me pityingly, poor dumb broad, can’t even get to a yoga class). The hour arrived- I think it was 6 PM on a Thursday, as though it mattered- and I walked into the classroom. In one sense, this should have been easier- I’d already done some yoga classes. However, I now understood that, by yoga-world-rules, the yoga I’d been doing was sub-par. This was REAL yoga. Longer-than-an-hour-yoga. With candles. When the teacher walked by me, I sweated more. Please don’t talk to me, I prayed. Please don’t look at me, don’t talk to me, don’t engage with me at all until I know what I am doing. From the corner of my eye, I studied my fellow students and attempted to blend in. Aha, a block-shaped thing (later I would find this was called a “block”) could be placed by the mat. Crazy thing that looked like my brother’s childhood Boy Scout belt also at the ready. Crap, she’s got the special towel. I knew I should have bought the special towel. Once the stage was set, it seemed, one sat down on one’s mat and closed one’s eyes. I did so and immediately regretted not going to the bathroom before I left work. Do I have time to go before class? What time is it? Why didn’t I wear a watch? Why didn’t I put my mat where I can see a clock? What if they start while I’m gone? What if I miss some important information? Forget it. I can hold it for 75 minutes. But this yoga class- ah, it was so worth the emotional distress, and that soon melted away. The room had many windows overlooking the river, through which we could watch the sky change as the sun set. The teacher played fun music. He read inspirational quotes and just generally made the whole thing feel super, super special. I fell in love with yoga. And I began the healing process of getting-more-comfortable-in-my-own-skin- so I wasn’t quite so afraid of things as I used to be. I even started saying “hello” to the teacher, although anything beyond “hello” caused me to become tongue-tied. I felt that if I were to pause too long before him, all of his insight and wisdom would penetrate through my guise and see what an absolute mess I was. The mask would fall away and it would be clear that I was not a terribly functional human being. It was a few months into this practice that another student suggested to me that I might want to check out this yoga studio- where they offered a free class Wednesday mornings at 7 AM. Once again, I invested my emotional energy into detailed planning for and strenuous worrying about my first visit to a Real Yoga Studio. That morning, I still felt unbearably shy and awkward, sitting in the mostly-empty parking lot before class. What made me think I could handle a yoga class at a real yoga studio? And I loved this yoga studio. It was so perfectly warm and inviting. A special place just for yoga. Where yoga people went, and did yoga things, and shared yoga ideas. During the following year, I spent more and more time at geo, buying passes and doling the classes out to myself like a hoarded sweet. At the time I thought of myself as being poor** and yoga seemed like a luxury item. Nothing could have been further from the truth. The time I spent on my mat, especially under the guidance of trained teachers, was invaluable. Finally, it felt like there might be a crack in the mask I’d worn for so long. This mask was both a costume (“Normal Person,” the label may have read) and a protective shell. Up until that point, in any new social situation, I’d been sure that others were thinking what a loser I was. If someone laughed nearby, I knew it was at my expense. I felt most comfortable at home, but it was a sad and lonely thing. I was sure that nobody liked me, and I didn’t know how to change that. I cried a lot. I took a lot of medication. And when I did go out, I put on the mask. It was a lousy mask, really, because it just made me look like I didn’t like you very much. Yoga gave me the stillness to hear my inner dialogue and the confidence to question it. Am I really klutzy, or is that just something someone told me once? What if I am not ugly? What if they’re not laughing at me? What if I AM worthy of the teacher’s attention? and, most importantly, perhaps… What if other people are feeling this same way? I began to notice all the ways that I avoided interacting with other people, based on fear. I even found that I had chosen not to buy a new bag to carry my mat in because I thought it might take me too long to put the mat away after class, meaning that I not be the first one out the door and might have to actually talk to people. The change was gradual, but I think you probably know by now that somewhere along the journey, the mask just fell away. One of my earlier teachers was a beautiful young woman who was so open. I clearly remember walking into the room- she turned to me and smiled and her whole face lit up with her “Hello!” I thought, wistfully, I want to be that way. I want to be open and smiling and friendly and filled with love. I’m looking back from the edge of this anniversary to that sad and lonely Laura, clutching at her mask, and I don’t know how I look to you, but I feel open and smiling and friendly. I am filled with love for her, and with compassion and kindness. There’s gratitude, too, because when I meet new students, sometimes I recognize the trepidation, the self-doubt, the fear, and it helps me to know how to meet that with love and understanding. * It was an Intro to Astanga Class, and it was harder than any practice I’d ever done before. So many vinyasas! I thought, Nobody can do this many and still walk out of class alive. I didn’t realize at the time that, out of pity for us, the instructor was only doing them between postures, and not between sides, as is traditional! …and when she explained Janu Sirsasana B, I thought, What! This can’t be right. Nobody’s foot should go there. When we finally got to Navasana (FIVE TIMES?! ), I was trembling, drenched with sweat and wondering how I’d make it through a day of work after the experience. On the positive side, I was so exhausted that social anxiety fell away and I remember being able to chat with other students as I left. Not the teacher (she, like my previous teacher, was on an untouchable pedestal in my mind), but at least the students. Had you told me that morning that in just a few years I’d be doing twice the practice with twice the vinyasas 6 days a week, I simply would have thought you were talking to the wrong Laura. ** once again, I wouldn’t have believed you if you told me how much poorer I could get! This entry was posted in Gratitude, New to Yoga, Social Anxiety, Yoga Cures Stuff and tagged nervous about yoga, social anxiety in yoga, yoga cures social anxiety on July 3, 2013 by laurasana. You are definitely that open warm person you aspired to be. I really enjoyed this one…imagine the trepidation I felt as a man walking into an Ashtanga yoga studio for the first time four months ago for the LAST class in the previous month’s intro course…it was crazy how apprehensive I was! Laugh. Like you the universe seemed to put *exactly* the person I needed in front of the class that day and I’ve enjoyed these months of immersion beyond measure. Funny that you’re reflecting today, there’s a new Kino blog entry on huffington (shared on my FB page) where she does the exact same thing but in a slightly different context. I’m coming to learn these moments ARE the yoga. Great post Laura. Thanks Bekah- looking forward to reading your next post…! 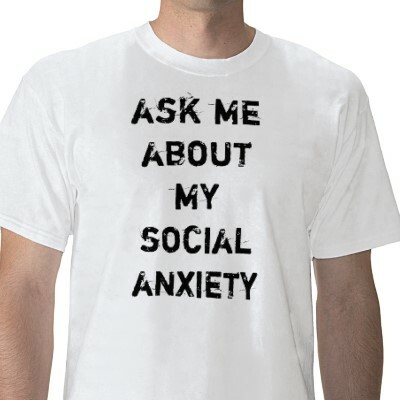 Baby Girl, my friend and teacher, there is nothing stupid about having social anxiety…. I struggle with it, sometimes only doing and being on certain days, depending on how I feel about myself, which hasn’t been great lately, if we’re being brutally honest here. You are amazing, and so are all of us who struggle to take those first baby steps toward something new. I love you and wish you a safe and happy 4th of July. See you next week! !